I would like to thank everyone who has bought my Penguin Idioms. It has been selling very well for 30 years! It has been a number one bestseller on Amazon.co.uk (Quotes) and Amazon.de (Spelling / Sprache), Most Wished For and Most Gifted, on and off for the last two years. 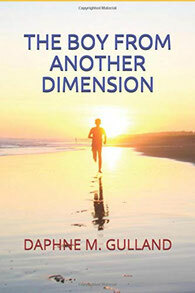 My sincere thanks go to all of you who have written very friendly reviews, praising my dictionary, on Amazon.co.uk. I wrote the first edition of this book together with my father, David Hinds-Howell (1916 – 1995). It brought us many hours of joy, excitement at finding new idioms, and deep satisfaction when Penguin accepted it. The English language is full of pitfalls – bizarre spelling, illogical rules of grammar – but the most common problem lies in understanding and using the vast array of idioms. Power nap, the Oprah effect, girl power, sticking one’s neck out, to jump the queue – these are just some of the thousands of idioms that have become an integral part of the English language. The Penguin Dictionary of English Idioms looks at a vast range of examples, providing concise definitions and explaining how they should be used. This practical guide is arranged by theme, making it possible to compare all the idioms in that subject area and find the right one for the occasion, whether in writing or in speech. Reading poetry is a good way of relieving yourself from stress. You will find soothing Nature poems here, poems about Merlin, relaxing daydreaming poems, interesting spiritual poems and many others that might surprise you. Stunning photos in colour from around the world will increase your enjoyment of these unusual poems. There are notes at the end of the book with suggestions of nice things for you to do in connection with the poems, such as choosing to watch short videos on YouTube, look at books or websites connected with the poems, listen to songs, smell a flower or go barefoot in the park. Here is a joyful way to acquire new knowledge, develop exciting new interests, and have beautiful new experiences. 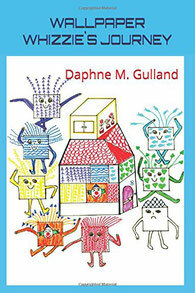 You can read some of these poems on this website under Daphne Gulland's Poems, if you like. Enjoy! This is a collection of English similes with definitions and examples. 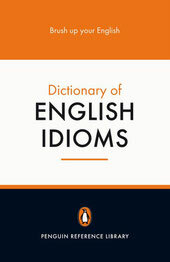 It is a companion to the Dictionary of English Idioms but it is very much easier and so it is suitable for beginners. It is arranged in themes, just like the Idioms dictionary, and there is an index at the back. Wallpaper Whizzie is a cheeky and loveable square of wallpaper. Step inside Heidi and Kevin’s house, and follow Wallpaper Whizzie’s exciting adventures. Will Wallpaper Whizzie come to a sticky end? Will he end up with the wicked Wallpaper Woppies on the rubbish dump? Will he choose to stay with Heidi and Kevin, or will he finally reach the Castle in the Air and find perfect happiness? Here is the front door; come in and find out! 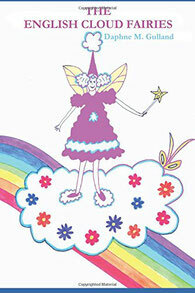 Tinki, Topsi, Silki and Flexi are Cloud Fairies who are learning magic at Cloud School. Cloudia is their teacher. The Cloud Fairies fly around Britain on their clouds in search of adventure. They are always prepared to help people in trouble. Sometimes their magic spells go wrong, as they still have a lot to learn at Cloud School. The North Wind loves annoying the Cloud Fairies, but they always get the better of him. There are also eight Happy Daydreaming Exercises to help children improve their memory and stimulate their imagination. Parents might like to do these with their children. They are an enjoyable way to relieve stress and generate positive thoughts. Would you like to jump onto a cloud and follow the Cloud Fairies? Here is a pretty, fluffy cloud for you. Let’s go! Agnes and Peter need to know the answer to a very important question. Whatever can they do? A friendly neighbour shows them how to make a labyrinth in her garden. The answer can then be found in the centre of their labyrinth! This is the beginning of their amazing adventures. They enter an amazing labyrinth and have many adventures. They meet fairies and elves, unicorns and mischievous goblins, sweet Rolling-Along-Stones and a fierce looking dragon that loves bitter chocolate. Are you ready to go with Agnes and Peter into this amazing labyrinth? The purpose of this playbook is to help children to enjoy learning English. 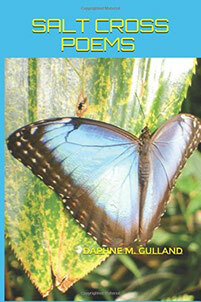 This book is specially designed to speed up the child's ability to remember English vocabulary and spelling. 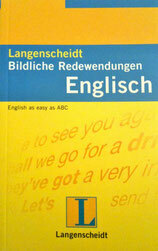 At the end of each chapter there is a section on spelling and an explanation of interesting phrases and unusual words. There is also a spelling quiz for children who love spelling, and many pictures for the children to colour in. 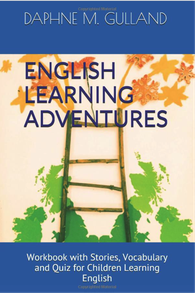 “English Learning Adventures” has been written to help schoolchildren to learn English spelling and vocabulary in an easy and enjoyable way. It is perfect for children who have already been learning English for one or two years. This book has been specially designed to speed up their ability to remember English vocabulary, improve their spelling and to read and understand short stories in English. 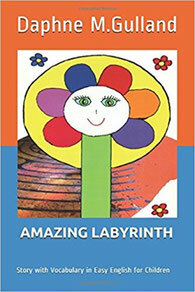 There are 30 short stories, lists of easy words, word games, questions, useful phrases and affirmations. Star Games make spelling exciting and interesting. Penny and Brian are two psychic children who make friends with a boy from another dimension, called Tom. Tom wishes to do certain things on Earth before he goes to Heaven. The children gladly agree to help Tom, and, in doing so, they transform the lives of everyone they meet in surprising ways. You can read about Tom's strong, powerful bodyguard who is his Guardian Angel, his new friends - the earthbound children, a medium, a dreamy psychic lady, and many others. There is a delightful and surprising ending which will warm your hearts! This fantasy story covers the themes of angels, Souls, Heaven, near-death experiences (NDEs), reincarnation, forgiveness, and most important of all, Love.